Virtual Banks Promise Full Service, But Are They Safe? p> Internet business is booming – and more and more companies and services are abandoning traditional “brick nod mortar” physical locations altogether in favor of a lower cost, online-only model. The latest newcomer to cyber commerce is online-only banking, as new, virtual banks promise the same kind of services and security offered by traditional institutions. The trend began when banks began to offer online banking options alongside their usual services that allowed users to conduct most if not all transactions with the click of a mouse and a few passwords for security. Now, new banks are dispensing with the expense and logistics of maintaining physical bank buildings by keeping all banking services on the Internet. The process works much like the old online banking services do. Create an account, get passwords, and conduct transactions. Some online banks allow users free access to any ATM in the country for cash, while others issue their own debit cards and offer other services in full competition with traditional banks, allowing users to access their money and conduct transactions at any time, any place. As with any online transactions, identity theft is a risk in online banking. But accounts can be password protected on multiple levels and the usual rules for making safe online transactions apply — make sure that you can distinguish legitimate email correspondence from the bank from look alkies crafted by scammers and identity thief phishers. And pay close attention to statements and account documents to track down potential identity theft. Hicken, Melanie. 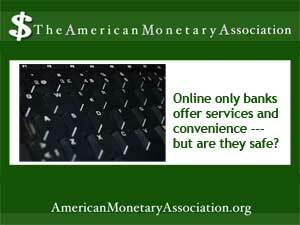 “Can You Trust Online-Only Banks?” CNN Money. CNN.com. 30 Aug 2013.